Vermont's Only Pediatric Plastic Surgeon Donald Laub Gives Kids A Reason to Smile | Features | Kids VT - small people, big ideas! Opal and Patrick Sutton are real-life wonders. 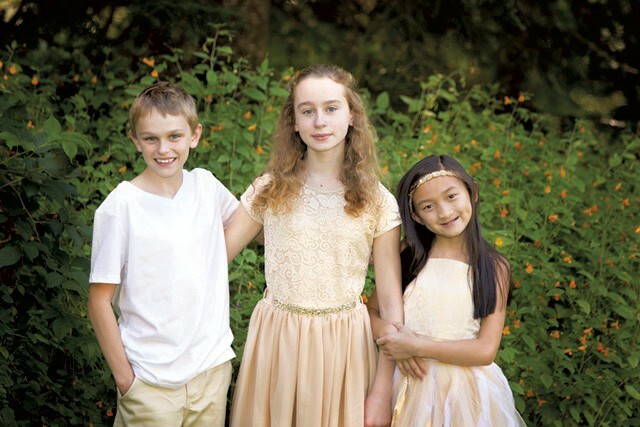 Like fifth grader Auggie Pullman, the main character in the 2012 children's novel and recently released motion picture Wonder, Opal and Patrick were born with severe craniofacial anomalies. Both children, who are biologically unrelated, were abandoned as infants on the streets of China and defied overwhelming odds to survive. Opal was born with a large craniofacial nevus, or "mole gone wild," as her father, Doug Sutton, calls it. It covered 75 percent of her head and 25 percent of her face. 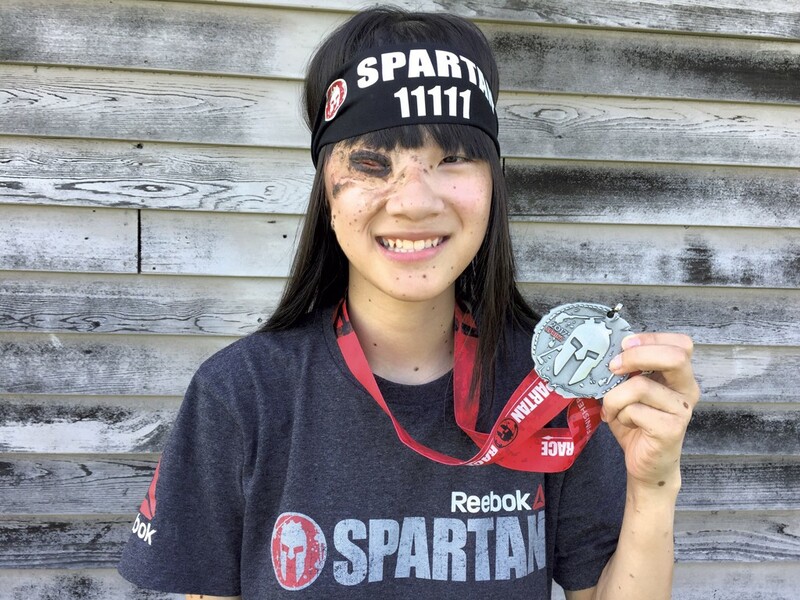 The skin condition was so severe, Sutton notes, that the Chinese adoption agency removed her from the adoption rolls because no one had expressed an interest in taking her. That is, until Sutton and his wife, Heidi, both nurses at the University of Vermont Medical Center, saw her photo. "She had this infectious smile that just latched onto me," recalls Doug Sutton. "That was the hook." He and his wife adopted Opal when she was 2.5 years old. 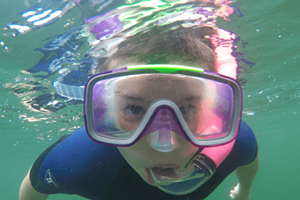 Patrick, whom the Suttons adopted first, was born with a severe cleft lip and palate, which made eating almost impossible. According to Sutton, his face was severely malformed, and he had teeth growing from the top part of his face and skull. When the Suttons brought Patrick home to Vergennes when he was 18 months old, he was so malnourished that he suffered from seizures and rickets, a bone disorder. Today, both kids are 13 years old. When their father is asked how they're doing physically and emotionally, he doesn't hesitate. "Fabulous!" he answers with a hearty laugh. Both kids are happy, healthy and active. They have two other siblings with special needs who were also adopted from China. In September, Sutton, his wife and all of the kids participated in the annual Spartan Race in Killington. As Sutton describes it, "They're the gazelles running across the Serengeti Plains, and I'm the lumbering rhinoceros just trying to keep up." Opal and Patrick are both patients of Dr. Donald Laub of Green Mountain Plastic and Reconstructive Surgery in Colchester. Each child has undergone dozens of surgeries, the vast majority of which Laub performed. According to Sutton, Laub essentially re-created their faces, which, in Patrick's case, enabled the boy to learn to speak. "He's been the best," Sutton said of Laub. "He really has done a fabulous job with Opal and Patrick. They wouldn't have gotten this in China." Laub, who's been practicing medicine in Vermont for 20 years, is currently the state's only pediatric plastic surgeon. 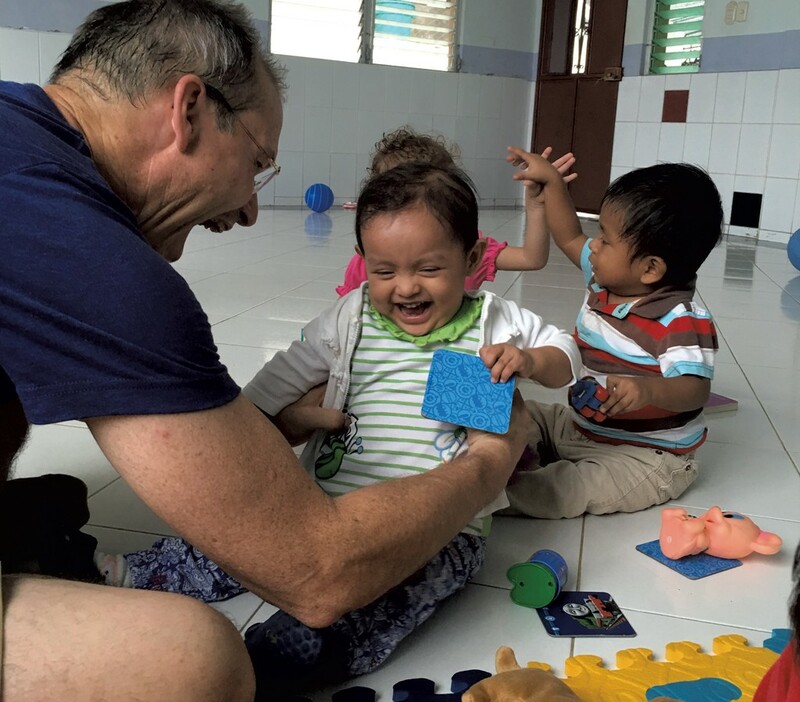 In addition to treating patients from Vermont and New York's North Country, Laub travels to developing countries to perform surgery on kids with craniofacial birth defects — or, as he prefers to call them, facial "differences." Though pediatric patients comprise only about one-fifth of his medical practice, Laub describes it as his most rewarding work. Kids born with facial differences are often teased and ostracized by their peers, resulting in lower self-esteem and difficulties in school and other social settings. Once, Laub recalls, he arrived at an overseas clinic to find a child waiting to see him with a paper bag over his head. Some cultures believe that children with facial anomalies are being punished for the sins of their ancestors or family members. "These kids haven't done anything wrong. They're born this way," he says. "These kids are sweet and cute. [My work] is a chance to ... make a big impact on the rest of their life." The most common birth difference Laub treats are clefts in the upper lip and palate, or roof of the mouth. During embryonic development, he explains, a fetus' head and face form from separate anatomical parts that merge into one as they grow. The groove on a person's upper lip, called the philtrum, is the seam where those parts fused. In some fetuses, however, those parts don't fuse completely, due to genetics, environmental factors or a combination of both, resulting in a fissure known as a cleft. Clefts are fairly common, he notes, occurring in one out of every 600 to 1,000 births. Indeed, in the midst of his interview, Laub received a phone call from a Burlington obstetrician about a baby who'd been born the previous day with a cleft. Some clefts are minor, Laub explains, and require only modest surgeries to make the lip appear normal and symmetrical. Others, however, dramatically alter the child's teeth, gums, facial bones and palate, creating significant functional difficulties with feeding, speech and hearing. When someone with a cleft palate eats, for example, food can enter the nasal cavity. A child born with a severe cleft may also be unable to speak. He or she may not be able to produce "plosives," or consonant sounds such as Ds and Ps, which are made by stopping and then releasing airflow using the lips, teeth and palate. Laub says that he tries to perform corrective surgeries as early as possible, sometimes on babies as young as 3 months old. Vermont is one of only a handful of states where the law requires insurance companies to cover such corrective surgeries for children. Some children complete their treatments by age 3 or 4, Laub notes, while others require multiple follow-up surgeries into early adulthood. The surgeon also treats kids born with irregularly shaped skulls, noses and ears, as well as large pigmented moles on the face or head, which can pose a high risk of turning into cancer. Laub heads the Vermont Cleft Palate/Craniofacial Clinic, a multidisciplinary team of health care professionals that has been caring for children with such birth conditions since 1969. The team's makeup can vary, but it generally includes a speech pathologist, an orthodontist, a surgeon, a pediatric psychologist, a geneticist, and an ear, nose and throat specialist. "It's very important to have that team," Laub explains. 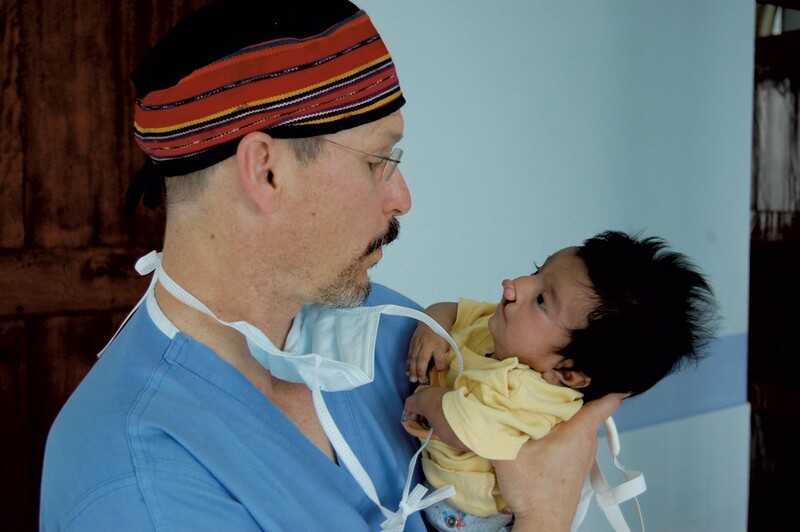 "Like you need a village to raise a child, you need a team to treat a child with a cleft." Laub's exposure to such work began in his own childhood. His father, Donald R. Laub Sr., is a retired plastic surgeon and Stanford University professor who also traveled the world with multidisciplinary medical teams to perform reconstructive surgeries on kids with cranial and facial differences. Laub's father participated in more than 150 overseas trips, occasionally bringing his teenage son along to observe. Laub remembers piling into the back of his father's Volkswagen microbus and driving south to Mexicali, the capital city of the Mexican state of Baja California, where his father worked with a local church mission to perform surgeries. At the time, Laub recalls, hanging out in a Mexican church didn't seem particularly exciting or fun. Later, when he was in college, he went on a similar trip to Portoviejo, Ecuador, with some of his father's colleagues. While there, the young Laub developed a whole new perspective on his father's work. "It was just fabulous," Laub remembers about that trip. "I was able to see what doctors actually did helping people, and that made me decide what I wanted to do for the rest of my life." Laub went on to attend what is now the Medical College of Wisconsin in Milwaukee, where his father also studied medicine. Eventually, the father-son team took trips together to Honduras and Vietnam with ReSurge International. The nonprofit group, which the elder Laub founded, is the first international humanitarian organization to provide free reconstructive surgery in developing countries. Both Laubs went on medical missions together until a brain tumor forced the elder Laub, who's now 82, to give up surgery in 2002. In all, the younger Laub, 58, has taken 22 trips to seven countries, often returning to sites year after year. In Guatemala, he's visited the same hospital eight times, which has allowed him to get to know the medical staff and track patients' progress. Though Laub works through several international aid groups, he says he typically covers his own travel expenses. The impact of Laub's work has also been dramatic in the U.S. Tre Nichols is a 19-year-old college freshman who grew up in Colchester and is now attending college in Barbourville, Ky. Nichols, who was born with a bilateral cleft palate and lip, a condition which affects both sides of the mouth, had several reconstructive surgeries performed by Laub, the most recent in December 2015. Nichols has only praise for his surgeon. "I just want to thank [Dr. Laub] for his contributions to making a difference to individuals like me ... and how he's been able to help alleviate some of the tough things about it and improve the quality of lives of his patients," Nichols says. "That's something I really appreciate." Kelly Manosh of Hyde Park agrees. Manosh and her husband, Jeff, adopted their daughter, Kerris, from China when the girl was 2 years old. The Manoshes knew beforehand that she had a cleft lip and palate. Kelly Manosh says that one reason they chose to adopt Kerris was because she had been a dental hygienist for 15 years and was familiar with complications of the mouth and jaw. But another big factor, she adds, was because she knew Vermont has such a good "cleft team" to help families every step of the way. "They were amazing," Manosh says. "They sat in a circle around us, and it was every profession that we needed and even some we didn't ... I knew we'd have the guidance we needed without having to research everything myself." When Kerris first arrived, Manosh adds, she could barely say "mama" due to the irregularities in her mouth. Today, Manosh describes her now 9-year-old daughter's speech as "amazing." In fact, she adds, most people wouldn't guess that she ever had a cleft. For that, she credits Laub. "He's very thorough, and he's very compassionate," she says. "It feels like he's super knowledgeable and experienced, so you feel safe and secure." For kids who started life with so many challenges to overcome, that's something worth smiling about.